Rockets Half Term Sports Camps! Organised by Rockets Community, every half term our award-winning team offer children an action packed 2-day camp experience. 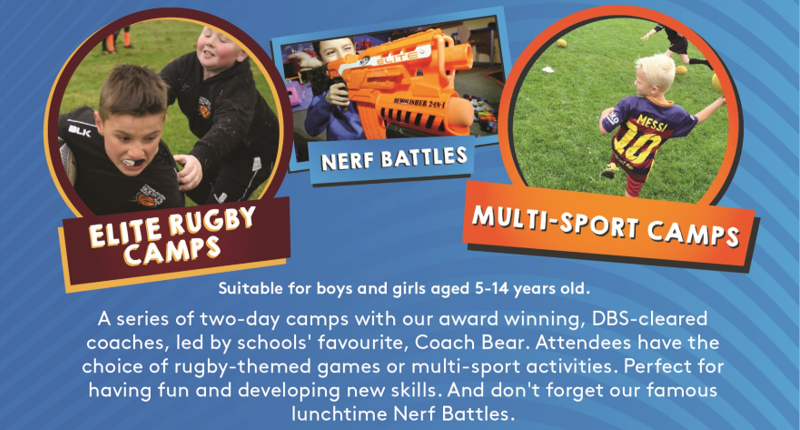 Children aged 5 – 11 can choose from Rugby or Multi-Sport Activities every day upon arrival. Perfect for existing players looking to develop their skills, players new to rugby or those just looking for a fun way to spend the holidays. Children aged 11 – 14 can sign up to our Elite Rugby Contact perfect for those wanting to experience contact rugby in a fun, safe environment. Available for all boys and girls aged 5 – 11. During the two days attendees will play a variety of sports including dodgeball, football, basketball and more. Using our specialist coaches, we create the perfect environment for children to come along, play lots of games and make some new friends. Available for all boys and girls aged 5 – 11. During the two days children will experience rugby like never before, no boring drills allowed all coaches apply the method of learning through play. This means no one standing around, everyone engaged all the time! Perfect for any new beginners or children who have played before. Available for children aged 11 – 14. Fancy yourself as the next Sam Burgess or simply want to play rugby with your mates during the holidays? Either way this is perfect for you. Using our proven coaching methods and with support from professional side Newcastle Thunder we have created two action packed days where players can develop their skills technically, tactically and socially. With sessions tailor made for the needs of the group this is a great opportunity for players of all levels of ability to come and have a positive rugby experience. Available for all groups throughout the two days. Coaches select a designated time for the attendees to play with their own Nerf Guns or borrow from the club. Weather its shooting at targets to win prizes or chasing each other around the field, the children absolutely love it! All camps run 9am until 3pm at Cramlington Sporting Club, NE23 6BN. Pre-booking online costs £12.50 a day, saving £2.50 compared to the £15 cash on the day price. A further discounted price of £10 a day is available online when using the promo code ‘SCHOOLS’. Anyone attending will require suitable indoor and outdoor clothing, a packed lunch and a drinks bottle. To book for the Cramlington camp or to see the available dates by click HERE.